Come by Herb Chambers Ford of Westborough as you search for a compact SUV that will make your life easier. Trust our team here in Westborough to find you the best vehicle possible. 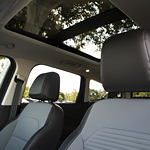 We are excited to help you see the convenience features that the popular Ford Escape offers. Backing your vehicle out of a parking space should not be a big bother and it should not be something that you dread doing. There is a rearview camera in the Ford Escape that can help to make backing up something that you can handle with ease. Have you ever walked up to your vehicle with your arms full and found yourself unable to get into the vehicle in any way? Have you struggled to put everything down on the ground without dirtying it or spilling your bags? The lift gate at the rear of the Ford Escape can open for you without the use of your hands, making it very convenient to use.